Lightly spray Bundt™ pan or gelatin mold with non-stick cooking spray. Wipe off excess spray with a paper towel. Pour 3/4 cup water into a saucepan and sprinkle with 1 teaspoon of plain gelatin and let it dissolve for 1-2 minutes. Heat over low heat, stirring constantly, until dissolved (about 5 minutes). Add 1 package of cherry gelatin and whisk until completely dissolved, at least 2 minutes. Add 1/2 cup cold liquor and stir to combine. Pour 3/4 cup of the cherry gelatin mixture into your prepared pan or mold and refrigerate 20-30 minutes, until gelatin is slightly firm but still sticks to your finger when touched. Meanwhile, refrigerate the remaining cherry gelatin mixture in bowl about 5 minutes or until slightly thickened. Gradually stir in 3 tablespoons of yogurt until well blended, and allow mixture to reach room temperature. To make the white layers, dissolve 2 packets of plain gelatin in 1 cup water for a minute or two. Slowly bring to a boil, stirring constantly. Remove from heat and stir in sweetened condensed milk. Pour 3/4 cup of this mixture over previously set red layers and refrigerate until slightly firm, checking after 10 minutes. Reserve remaining sweetened condensed milk mixture for additional white layers. To make your first set of green layers, repeat steps 2-4, using lime gelatin in place of cherry. When clear green and creamy green layers are formed and still sticky to the touch, top with 3/4 cup of remaining sweetened condensed milk mixture to form your second white layer. Refrigerate until partially set. Repeat all steps with remaining red gelatin, sweetened condensed milk, and green gelatin layers, for a total of 11 alternating clear, creamy and white layers. Your final layer should be a creamy green layer. Refrigerate overnight. To unmold, fill a larger container or clean sink with warm (not hot) water. With clean fingers, loosen the gelatin around the edges of the mold cavities. Next, submerge the mold in the water almost up to the top edge for 5-10 seconds until edges have completely loosened from the mold. Dry the outside of the mold with a towel, place your serving platter on top, and invert to plate. Add your 11 layers to the pan in the following order: clear red, creamy red, white, clear green, creamy green, white, clear red, creamy red, white, clear green, creamy green. The texture and temperature of your layers is important in this recipe. A few tips: •	Don’t let a layer set completely before adding the next one; if it’s too firm, the new layer you’re adding won’t bond appropriately. •	Make sure gelatin mixture for each layer has cooled to room temperature before you add it to the other layers in your mold. If the gelatin you’re adding is too warm, the layers won’t be well defined. •	As the layers progress, the setting time will become shorter as the pan and gelatin becomes colder, and the layers become thinner as more layers are added to the mold. You will need to check on the layers as they set to determine when to add new layers. Is there anything more classic than a Jello salad? 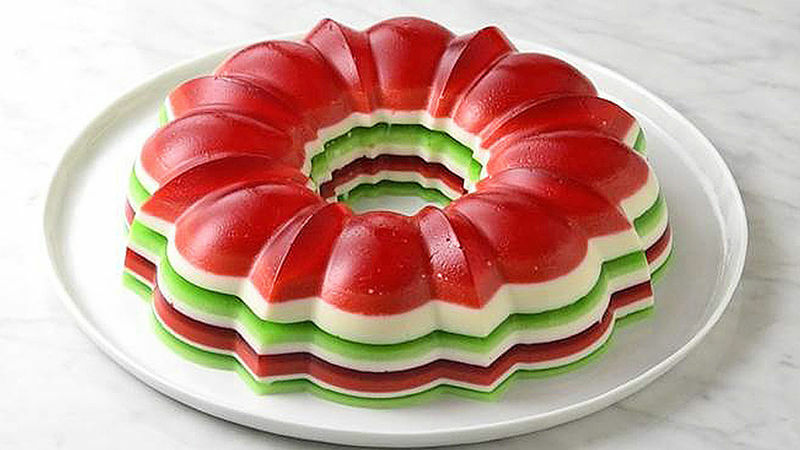 When it comes to dessert for Christmas, we can’t think of anything more festive than this Christmas Jello salad ring. With alternating layers of red, white and green, this holiday dessert is a boozy gift to bring to your Christmas parties. The trick to achieving clean, clear layers is to add the next layer at just the right time. If the previous layer hasn’t set enough, the lines will blur and you won’t get that crisp separation. Wait too long and the layers become too firm and won’t stick together. A simple way to check if a layer is ready is by touching the Jello with your finger. If the layer is mostly firm but sticks to your finger, then it’s ready for the next layer. And if your finished Jello salad ring won’t release from the mold, setting the mold in a warm water bath for five to 10 seconds should help release the Jello. If you prefer to make a non-alcoholic version of this Jello salad, just swap in water for the alcohol and you’ve got a family-friendly version even the kids can enjoy.